The electricity produced by power plants with Caterpillar generator sets, that use natural gas as fuel is a common application for us. The particularity of Gas to Power projects is the power plant’s location near a gas source that comes from oil or gas wells. Instead of the old procedure of burning this well-head gas and of environmental pollution, G2P means its recovery, its treatment and use to produce electricity that is delivered to the national electricity grid, and to the sites where it is needed, these plants can provide also the necessary thermal energy. Although the fundamental technical solution of a gas plant is standardized, each G2P project has its characteristic features: gas composition, geographical and environmental conditions (the relief of available ground, limit temperatures, altitude), that the operating parameters and efficiency of the plant depend on, the site where the plant will be installed – which may considerably make difficult the placing and assembling works, but also the operation of the plant. The most recent project of this kind, the third after those of Moinești and Dofteana, is executed at Cobia, in Dâmbovița county, coordinated by the Gas Projects responsible, Cristi Bivolaru. With a 1 Mwe installed electrical power, this project was built in record time. 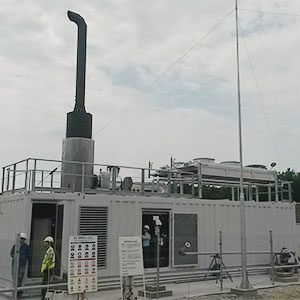 From March to September, the project responsible Adrian Nica coordinated the purchase of equipment and components for the G2P plant, getting the required permits and authorisations, construction of the container with the generator set, of the accessories and electrical panels, pouring foundations and making all necessary connections required for the plant operation (gas supply pipeline, electricity line up to the connection point of supplying electricity to the grid etc.). Final testing and commissioning will be carried out in early October. Our thoughts fly to the next project, to new challenges! Share the post "Romania – Cobia – Supply of an emergency natural gas plant"